Back in August last year I built a dummy load out of a bunch of resistors, a paint tin and some oil. I said at the time that it seems to work fine on HF but not so well on VHF. After I used the load last weekend to test my aerial, I thought perhaps I’d put it on the analyser and actually check and record the performance. 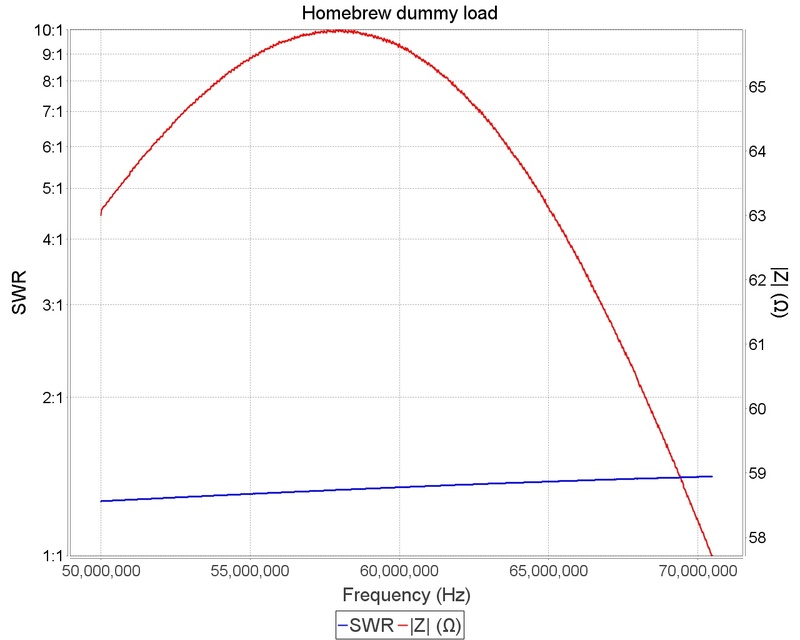 Firstly I checked the SWR and the impedance between 1.8MHz and 29.7MHz, the normal amateur radio HF bands. 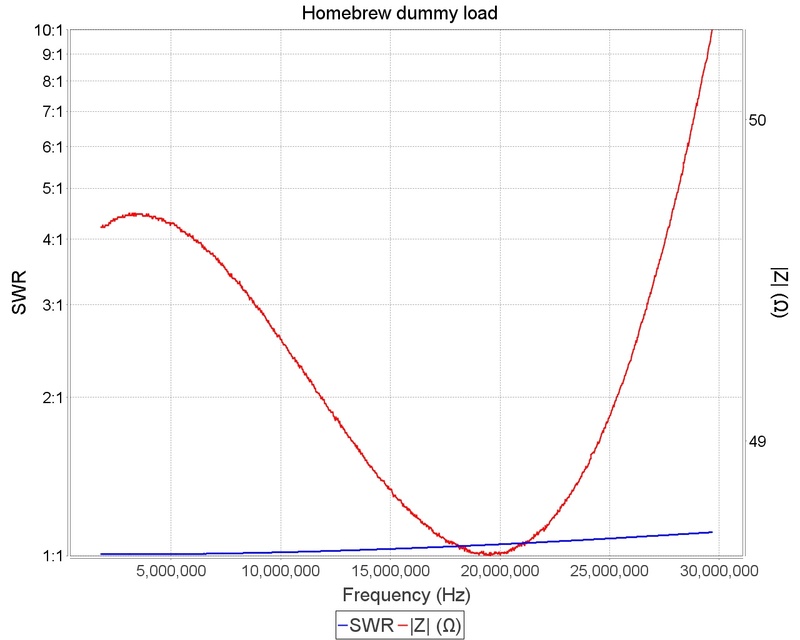 The SWR is 1.01:1 at 1.8MHz and 1.11:1 at 29.7MHz and the impedance measures 48.6 ohms at the lowest point and 50.3 ohms at the highest. That’s very acceptable and it’s the best I could have hoped for considering the resistors I used. On to the mid range bands. I tested between 50MHz and 70.5MHz to include 6m and 4m. A different story now – The SWR is still respectable at 1.27:1 at 50MHz raising to a not very good 1.41:1 at 70.5MHz but you can see that the impedance of the load varies quite a lot between 57.7 ohms and 65.9 ohms. I’d still use the load on these bands but it’s right on the edge of usability at 4m. I then tested the load on the 2m band from 144MHz to 146MHz. 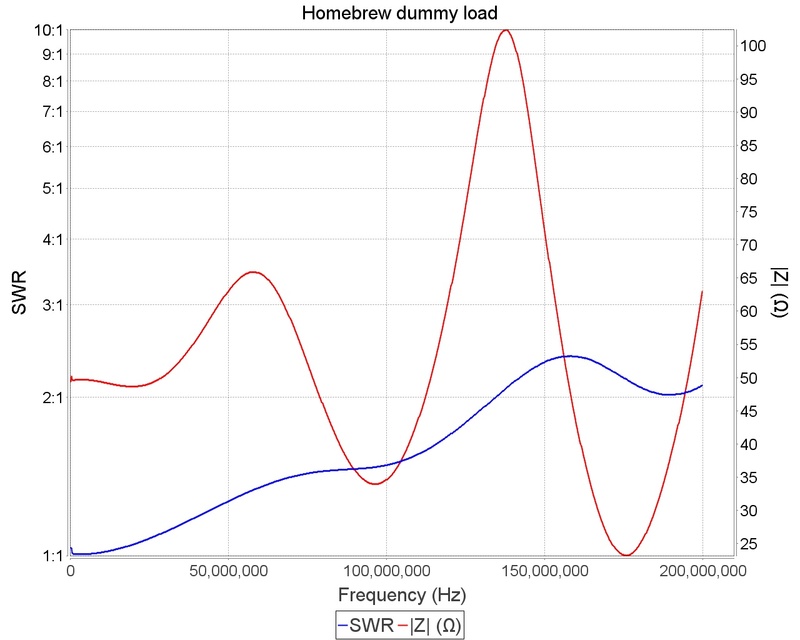 The SWR is pretty constant at 2.25:1 and the impedance drops from 91.6 ohms at the bottom of the band to 85.5 ohms at the top. I wouldn’t use this dummy load on VHF. I’ve still not dared to use my amplifier into the dummy load yet – The resistors in air are rated at 90 watts and although that should be significantly higher when submerged in oil, I’ve not yet tried. I said before that I’m going to build a higher rated load so I’ll leave that for the amplifier. Nice job on the dummy load – very much acceptable for HF use! In the case of your dummy load, I might guess (but could well be wrong!) that it gets increasingly inductive at VHF due to the lead lengths of the resistors (including the connections between them and the coax), which you can see if you look at the complex impedance. Wonder, the result of using a inductance of a few nano Henry’s (nH) in series with the DL. I saw this done in one dummy load to tune the ‘self capacity’ out…… mind you it used brass plates instead of strip board, his graph improved dramatically from about 20Mhz onwards. Brass plates would offer more capacity I guess but with less inductance. It’s great to see someone else’s efforts at this. I just completed a dummy load made from 12 old 25 watt 600 ohm Sprague Koolohms (non-inductive) and learned a lot in the process. The first time I mounted the resistors around two rings of heavy copper wire about 5 inches in diameter and had SWR rising to about 1.8 at 28 mhz. Redid it with two brass plates about 4 by 4 in 3 rows of four with a coax connector strapped across the plates, and saw about 1.6 at 28 mhz. On the final version I moved the coax connector to the center of one plate with a heavy enamalled wire thru the center of the load to the other plate and the SWR dropped to about 1.3 at 28 mhz, which is where I stopped. I guess what surprised me was how much reatance was introduced by what I thought would be physically small variations in the way things were tacked together. Just using a 7 bladed Super Boxer fn at the moment but its surviving 1 kw for short periods in apparently good shape. Cute but, there are better choices for less cost. Flange-mounted RF power resistors are available from sellers such as Henry Radio (ebay ID = henryradio) for modest cost. There’s a terminator currently listed for $17 USD that’ll handle 250W up to 2GHz. My DL uses four 50 ohm / 400W resistors (Anaren pn RFP50-400R) in series-parallel. 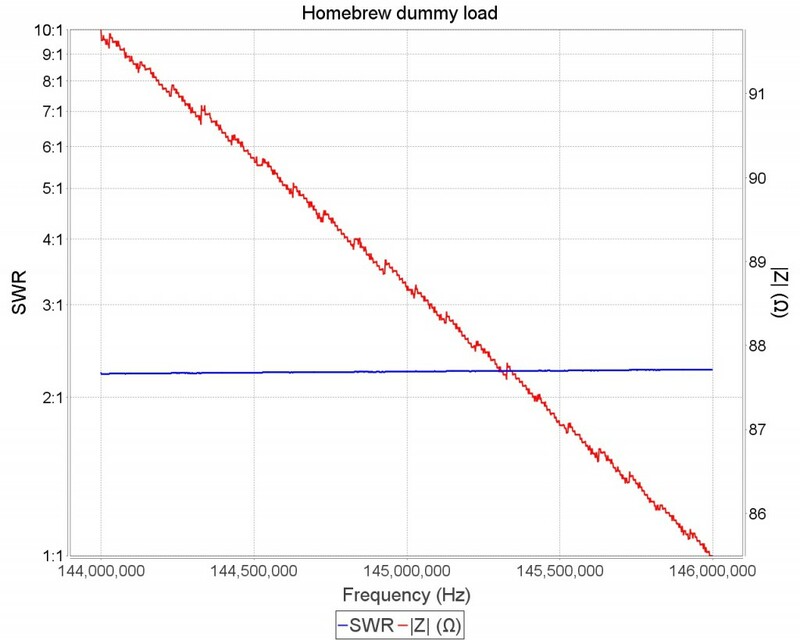 As measured on a vector network analyzer, VSWR shows less than 1.5:1 at 50 MHz. Extrapolating the measured temperature rise from 650W @ 40.68 MHz, it is within temperature limits up to 1500W at 100% duty cycle. I used an LM35DT “precision centigrade temperature sensor” to measure temperature. The resistors are mounted on two 140 sq. in. heatsinks, and air from a 100cfm tubeaxial (aka “Muffin”) fan is ducted up through the heatsink fins. It runs nearly dead cold with 1KW from my Heath SB220 amplifier.